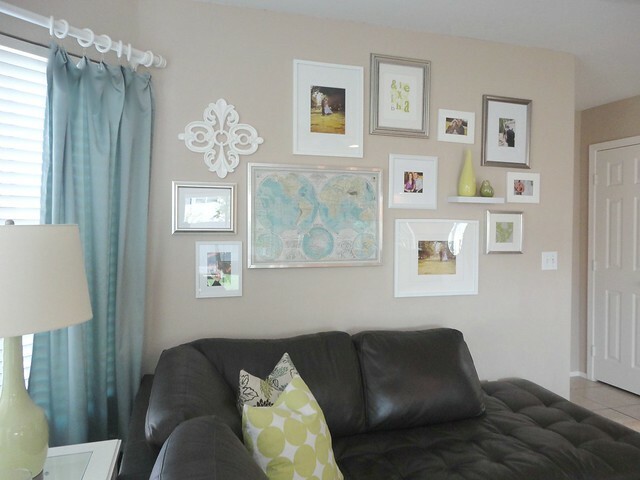 When talking about arranging art and photos on a wall, so many times I hear friends and clients say they haven't hung anything because they're scared they'll do it wrong or that it won't look good. So instead they have blank walls. But the thing is, what's the worst that could happen? You hang something and it looks bad? Then take it down and try something else. Believe me, it's very easy to fill nail holes. 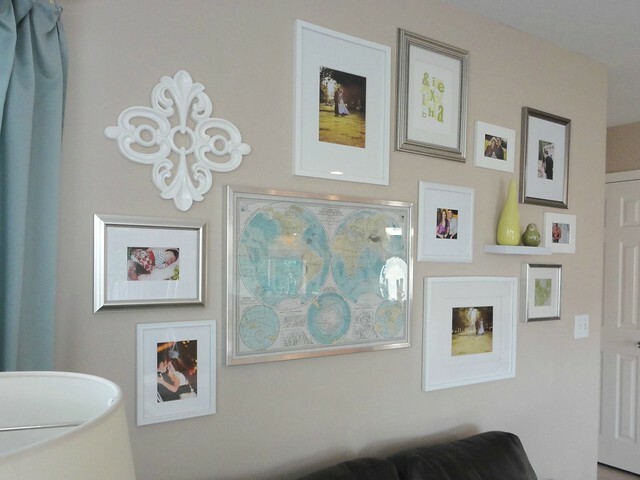 To illustrate my point, I'm going share with you some really ugly wall arrangements (and crappy photos) by yours truly. One wall in my living room has gone through many changes. This is what I hung up when we first moved in, yikes. Mostly I used items I already had, and then I spray painted a couple of thrift store finds. It's not good. Here's what I did next, I decided I needed some bigger pieces. Better I guess, but still scary. After we bought our sectional, I added to the arrangement. It stayed like this for awhile, but I wasn't truly satisfied with it. And this is how it looks now. Much better from the original crap fest. But I'm sure I'll change it again eventually. This just shows how it won't kill you to experiment a little. Yeah like me, you might go through some fugly arrangements; but eventually you'll find something that works. Ooo, I'll be pinning this for sure. Some gallery walls can be too overdone, but I really like this - a good number of stuff, but not too much. And I like using the white with the silver so it's a little varied but still cohesive. They all look good, but I agree, your last one is the best! I really love the final result. 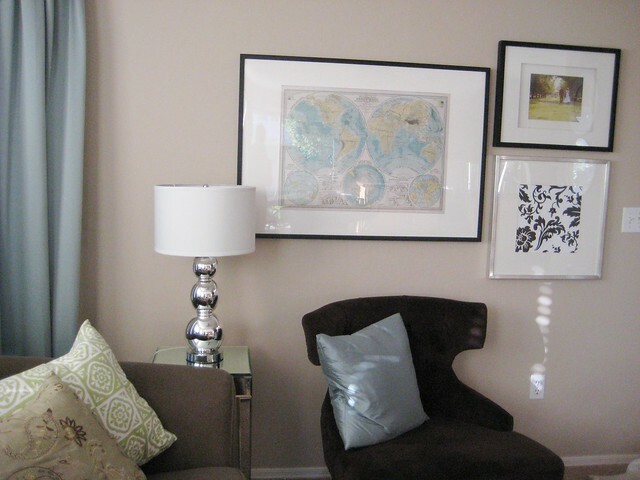 I like how the map, the shelf and the white flourishy decoration breaks up the pictures so perfectly. 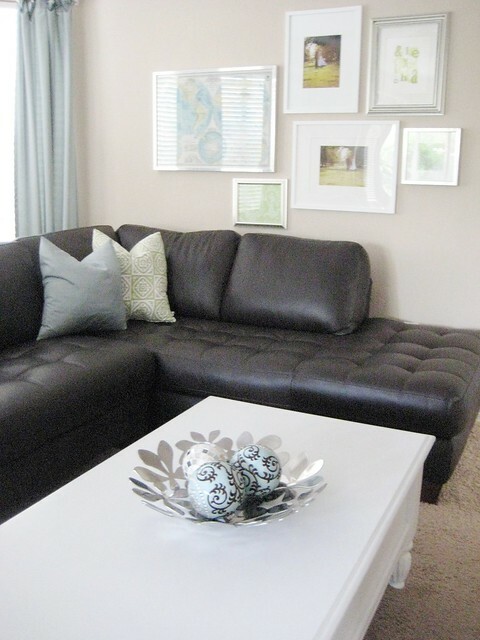 I love how you have the little floating shelf with the accessories on it and the other white ornate piece. That gives it a lot of interest. That looks close to a paint color on the wall that I have: BM Coastal Fog. ? Also I love that you have a dark sectional. It looks amazing. Truly Amazing!!! I think now i will be able to design my home very well. No doubt you have done a great job of compiling all these accessories together. You have to start somewhere right? I get the idea you were going for with your first arrangement. It just takes some moving around, adding and subracting some things to finally get your end result. I know I have an idea in my head, hang it on the wall, then realize it doesn't match the rest of my house so you mess around with it and boom! It fits perfectly! Thanks for sharing. 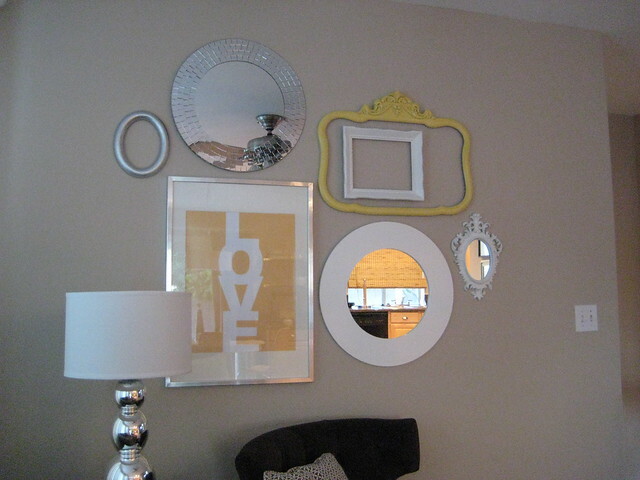 That is the beauty of wall decorations, you can really do anything and mix matching frames and colors is part of the fun. 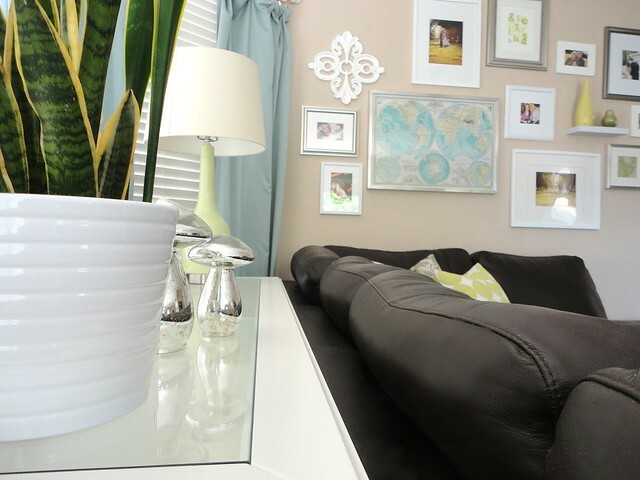 Try throwing some wall decal action behind the frames. It might be a nice touch! So true! I often tell people the same thing. This isnt life or death, its trial and error! Your last arrangement is truely awesome one. I noticed one thing that stuff with white background will go perfect with any one. Am I right?? The walls look great, I love the shelf in the middle of all the frames. The wall is decorated beautifully. Well done. I was just thinking today about how a room evolves in it's decor and just gets better each time. I'll look back at photos of how I arranged furniture or accessories the first time around and I think to myself "how could I ever think that looked good? Why did it take me so long to figure out that this looks so much better?" I love that map you have btw! Nice blog... thanks for sharing with us.. Your wall looks fantastic. Great art. Great wall decoration by the way, although I prefer that the wall looks much better with minimal frames or just a single one. Minimalism is simple, but I respect your taste on wall decoration. Well that's an amazing article! I just stumbled upon your blog and wanted to say that I have really enjoyed reading your blog posts.